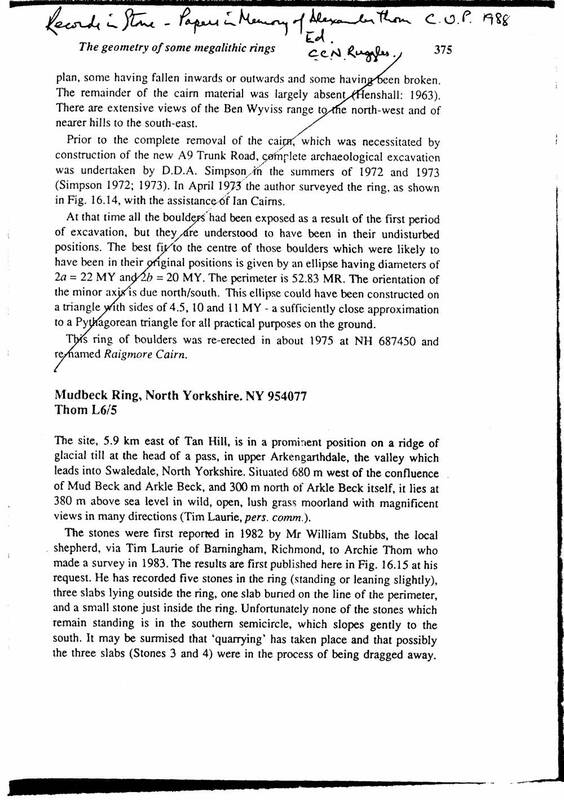 Location On rising ground at Mud Beck 850m NE of Beck Crooks Bridge..
Record Name Stone circle at Mudbeck Side. Record Description Circle of low (<1.0mhigh) sandstone slabs hidden by rushes and difficult to locate, 18.5m diameter comprising four surviving standing stones (see plan Nos 2,3,4 and 6), one fallen stone (No 1), one stone broken at ground level, the base survives in situ (No 5) and a probable ï¿½entrance feature on the Eastern perimeter indicated by the presence on the surface of three large slabs of similar sandstone (Nos 7,8 & 9) together with a pit from which a stone has been removed and a number of earthbound rocks. 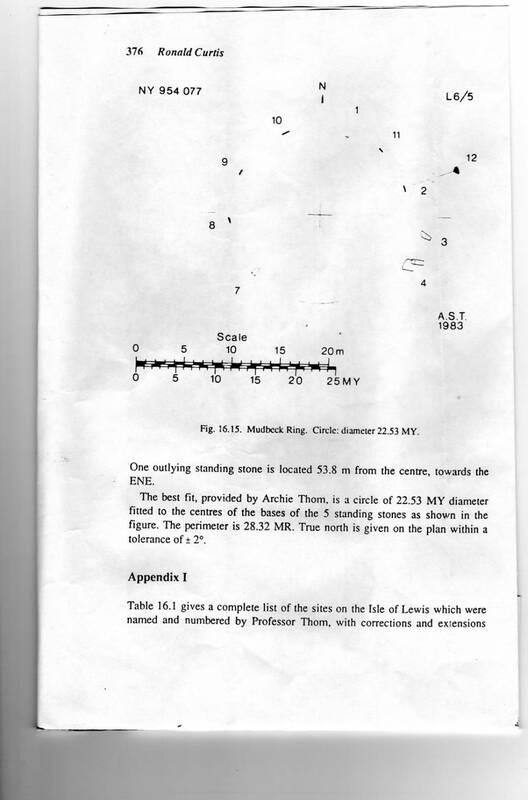 The perimeter of a true circle is well defined through 200 degrees of arc by stones 1-6 and les certainly by the entrance feature, stones 7,8 and 9. A single cup mark can be seen on the inner face of Stone 2, this may be natural but is made more probable by the existence of an earth fast sandstone slab with three aligned cup marks in turf some 70m check to the WNW. (ARK003). A single outlying standing stone is located 54m from the centre to the ENE. 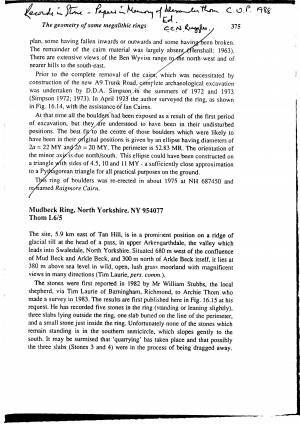 Additional Notes The Mudbeck stone ring was first noticed by the late Ramsey Hutchinson of Langthwaite who was then Game Keeper to the Duke of Norfolkï¿½s estate. The stone ring is located at precisely the point where the summit of the Stainmore Pass first becomes visible five km to the NW across the glaciated plain of Stainmore Forest. Arkengarthdale provide the most direct route available in Prehistory from tthriving Neolithic/Bronze Age population centres situated to the South and East (on the fertile gravels of Swale and Ure in the Vale of Mowbray) and those to the North and West (in the Vale of Eden). See Survey plan prepared by A. Thom (Thom, A. 198*). Reference A.S. Thom 1988. Mudbeck Ring, North Yorkshireï¿½. In ï¿½Records in Stone ï¿½ Papers in Memory of Alexander Thom. Ed. C.C.N. Ruggles. pp375-6.